Tomato Bouillon with Chicken Flavor. With Knorr Tomato Bouillon everything tastes better. Tomato bouillon makes an easy and convenient way to add flavor to whatever recipe you're making. 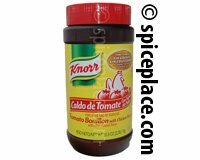 To make a delicious tomato broth, dissolve 2 tablespoons of Knorr Tomato Bouillon with Chicken Base in 2 cups of boiling water. Use prepared Tomato Bouillon as desired or to enhance the flavor of your favorite soup, stew, sauce, rice, vegetable, mole and rice recipe. Product of USA. Store in a cool, dry place. Ingredients: Salt, Monosodium Glutamate (Msg), Corn Starch, Sugar, Beef Fat*, Hydrolyzed Corn Protein, Natural Flavors, Chicken Fat*, Tomato Powder, Autolyzed Yeast Extract, Citric Acid, Dried Chicken Meat*, Silicon Dioxide (Prevents Caking), Turmeric, Yellow 6 Lake, Dehydrated Parsley, Caramel Color, Disodium Guanylate, Disodium Inosinate, Annatto (Color), Yellow 6, Red 40. * Adds A Dietarily Insignificant Amount Of Fat and Cholesterol. Knorr® is a Registered Trademark of Unilever Foodsolutions, Lisle, IL 60532 US.